If you’re exploring the Eastern Shore of Virginia during the winter, you might find that it’s a bit brisk outside to explore the region’s beaches and nature trails, and that some businesses in resort areas like Chincoteague close for the off-season entirely. But there’s one place — indoors, with heat! 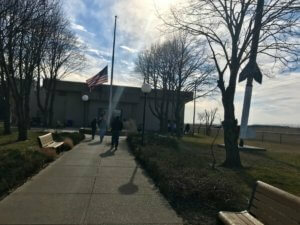 — that’s always open, where you’re guaranteed to have a good time and learn something new: The NASA Wallops Visitor Center. Outside the NASA Wallops Visitor Center. The Visitor Center is a popular field trip destination for kids, who get the opportunity to explore a number of hands-on exhibits, activities, and learn from the center’s weekly educational programs, but it has a lot to offer adults, too. Exhibits scattered throughout the building describe the history of the Wallops Flight Facility, from its first steps after World War II to the letters George H. W. Bush wrote his parents from the Chincoteague Naval Auxiliary Station during his time in the Navy in 1943. On another note, there are also pictures of the rhesus monkeys who pioneered Project Mercury capsules in the flight facility’s early days, which children and their parents will probably agree is the perfect blend of entertainment and education. There’s so much to learn within the walls of the Visitor Center that prospective visitors will want to budget several hours for their trip to take in all the information it offers. Here’s a brief history of NASA Wallops, but it’s only the tip of the iceberg — or the nosecone of the sounding rocket, if you will — of all the museum has to uncover. 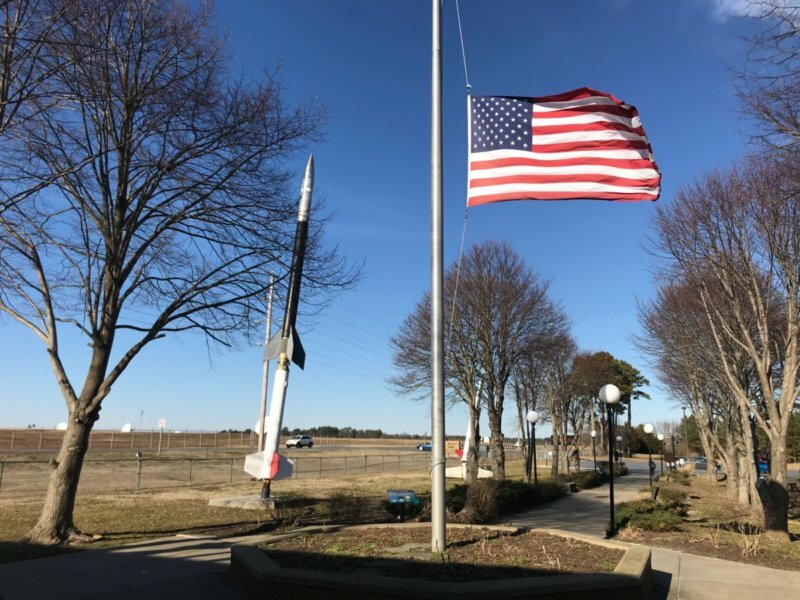 The original rocket launch site on Wallops Island was established in 1945, under NASA’s predecessor, NACA (the National Advisory Committee for Aeronautics) and under the direction of the Langley Research Center. The site conducted high-speed aerodynamic flight research, which led to improved aircraft and rocket designs. After World War II, engineers and the facility were able to perform research for non-military purposes; their research led to the creation of hypersonic rockets that could escape the Earth’s atmosphere. Congress established NASA in 1958, which absorbed NACA field centers including that on Wallops Island. NACA’s Pilotless Aircraft Research Station became NASA’s Wallops Station, which would play an important role in the “Space Race” between the U.S. and the Soviet Union in the late 1950s. When the U.S. was researching manned space flights, piloted suborbital missions were launched from Wallops. These were Project Mercury capsules; Some tests implemented the Little Joe booster rocket, which was used to test escape and recovery and life support systems, and monkeys Sam and Miss Sam were launched into space in the place of astronauts. Both monkeys were recovered unharmed. When these early launch missions were relocated to Cape Canaveral in Florida, Wallops’ facilities were instead used to test hardware and train support personnel in the effort to launch a human being into space. In 1974, Wallops Station was renamed Wallops Flight Center, which became Wallops Flight Facility in 1981. In more recent years, the Flight Facility’s primary missions have included scientific balloons, aircrafts, and sounding rockets carrying scientific payloads, aeronautical systems testing, and range support for Space Shuttle launches. The NASA Sounding Rocket Program has conducted more than 2,500 missions over the years, enhancing our knowledge in galactic astronomy, solar physics, planetary atmospheres, high-energy physics, and more. As for scientific balloons, approximately 25 are launched from Wallops Island every year to conduct scientific studies. The Aircraft Office at Wallops provides for the operation, maintenance, configuration control, and mission support of assigned NASA aircraft as well as the planning and conducting of Airborne Science missions, while the Range and Mission Management Office provides project management support for launch operations and the Small Launch Vehicle Research Project develops preparation and support for small payloads. The NASA Wallops Visitor Center is open Tuesdays through Saturdays from 10 a.m. to 4 p.m. Admission is free.